I put this board together to give students additional practice using alphabetical order to determine on which page a given entry word would be found. First, I copied the kite pattern onto white paper. Then I colored each kite with pastels in small circular motions. Once I had covered the entire kite with small circular motions I went back and used my finger to rub in the color. 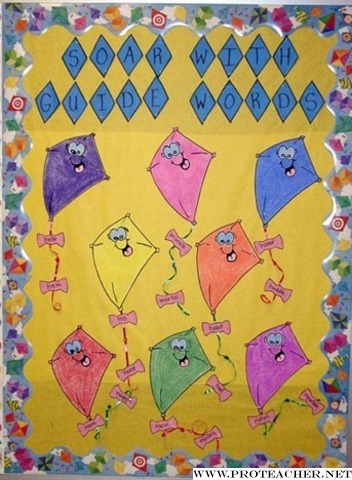 I attached each kite to the board along with curly ribbon as the string. I made two bows out of construction paper for each kite and programmed them with guide words. These are the bows you see in the picture. The entry words are programmed on seperate bows kept in a baggie. To complete the board students pin the entry word bows between the correct guide words. Students check their answers with the answer key that is stored in the baggie.